Top edge of d/j spine slightly bumped. This text provides an account of Taliban-like theocracies in the American heartland controlled by renegade Mormon prophets. At the core of the book is a double murder committed by a pair of brothers, Ron and Dan Lafferty, who insist they were commanded to kill by God. 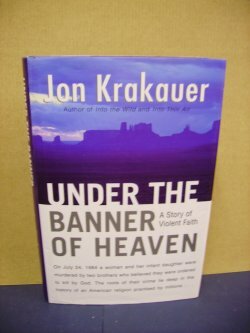 Beginning with an account of this "divinely inspired" crime, Krakauer constructs a multi-layered narrative of polygamy, savage violence and unyielding faith. Along the away he uncovers a shadowy offshoot of America's fastest growing religion and raises provocative questions about the nature of religious belief. 372pp.